Interested in current research in music cognition? As I mentioned in an earlier blog entry, two weeks ago a successful edition of the ICMPC/ESCOM conference was held in Thessaloniki, Greece. The ICMPC is an international conference on music cognition that was this year ambitiously put together –and not without risk– by Emilios Cambouropoulos and his colleagues. Despite the difficult times for Greece it turned out to be a great success in terms of the number of participants that attended and the quality of the presentations. If you are interested in what the current topics and issues are in the field of music cognition, you might find the reviews by researcher Vicky Williamson (Goldsmiths, University of London) helpful. She just released them as an e-book – about 40 pages of blog entries! As you will see, they give a lively impression of the conference through a personal and engaging selection of the five parallel sessions and four keynotes that made up the elaborate program. A wonderful contribution! Cover of NRC Cultureel Supplement. It was Darwin’s hunch: music, as widespread as it is in our human culture, could well be a result of sexual selection, one of the two selection mechanisms he proposed to be at the basis of our evolution (the other being natural selection). Today an article by Wim Köhler appeared in the Dutch newspaper NRC elaborating on this idea: the potential evolutionary advantage of ‘mooizingers’ - those who perform well musically. Cognitive biologist Tecumseh Fitch (Vienna University) and his colleagues recently designed an experiment to put the sexual selection hypothesis to the test: does the ability to produce complex musical sounds reflect qualities that are relevant in mate choice contexts, supporting the idea of music to be functionally analogous to the sexually-selected acoustic displays of some animals, such as songbirds? If this hypothesis is correct, women may be expected to show heightened preferences for more complex music when they are most fertile -- was the reasoning of the Vienna research team. To to test this hypothesis the Vienna team used computer-generated musical pieces and ovulation predictor kits. The researchers found that women prefer more complex music in general, but they found no evidence that their preference for more complex music increased around ovulation. As such these findings are not consistent with the hypothesis that a heightened preference/bias in women for more complex music around ovulation could have played a role in the evolution of music. More empirical research is needed of course, but for the time being and considering the empirical evidence that is available, there is no study, as yet, that supports the sexual selection hypothesis for music. 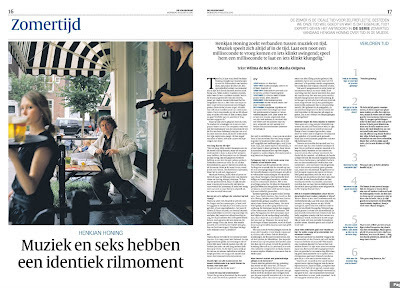 Volledige interview is te vinden op de website van de Volkskrant of hier. Afgelopen dinsdag nodigde mijn broer, Yuri Honing, mij uit voor een aflevering van zijn radioprogramma op Radio 6: een zender die zich profileert op het gebied van Jazz & Soul. Hij belde me een week daarvoor op met het verzoek simpelweg een stapel CDs mee te nemen. Onmogelijke opdracht natuurlijk. Zeker voor een familie waarin in muziek het hoogste van het hoogste is. Het resulteerde in dagen lang zoeken naar fragmenten die 'kunnen', 'zouden kunnen' of 'helemaal niet kunnen'.